Those are the words that grateful fans said all over the world this week as the big cheese celebrated his 90th birthday (he doesn't look a day over 70). As diehard fans know, November 18th, 1928 was the day the mouse burst on to the scene in Steamboat Willie, so it's on that day that we celebrate what's nothing short of a worldwide cultural phenomenon. Forgive the hyperbole, but rarely in our culture has a single character enjoyed such widespread popularity for so long. As a MousePlanet community, writers and readers, we're all big Disney fans, and we love all things Disney. I certainly fall into that category. But we all also gravitate to one or more aspects above all others. While I love it all, for me, Mickey has always been the big cheese, if you will. To help celebrate this momentous occasion, Disney created the Mickey Mouse: The True Original exhibit in New York City. 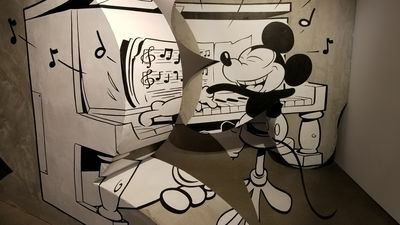 The exhibit was described by the tour brochure as "a pop up art experience celebrating the 90th anniversary of the one and only Mickey Mouse and his ever-present influence on popular culture; This is an unforgettable journey that explores timeless Mickey moments, reimagined by a collection of artists whose love for Mickey mirrors yours". 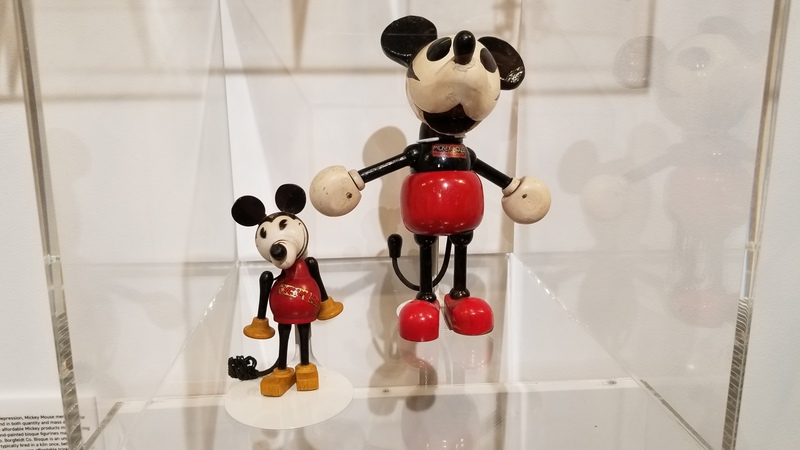 I jumped the gun by one day and visited on November 17th, and what I found was a wonderful blend of Disney history and historical artifacts and contemporary art by talented artists who have a very obvious love of the mouse. 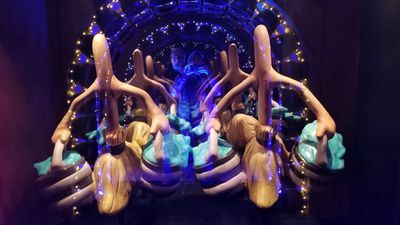 The exhibit was designed to be seen as a walk through Mickey's history and was arranged as a number of cut out rooms in a large warehouse setting. Come take a walk with me through the exhibit, and I'll share what I found through my own impressions and pictures. 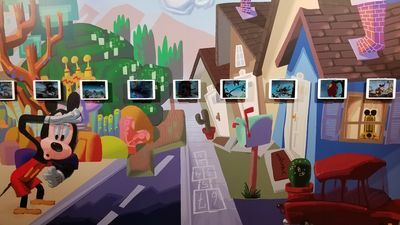 The first room you enter is understandably called, "Hello Mickey", which you come to after seeing a short introductory film on an enormous digital screen. 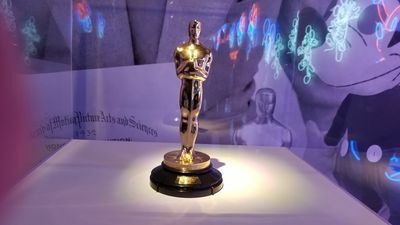 The first thing you come across is Walt's first Oscar, on loan from the Disney Family Museum. He won an honorary Oscar in 1932 for the creation of Mickey Mouse, so its inclusion at the exhibit start is more than appropriate. Walt Disney won an honorary Oscar for the creation of Mickey Mouse. Photo by Gregg Jacobs. 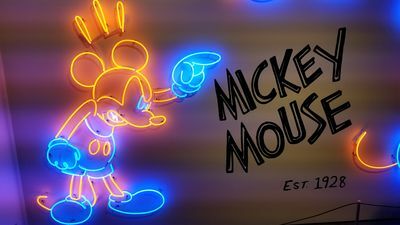 The room also features a massive neon light installation shaped in images of Mickey and Minnie Mouse, both in iconic and contemporary poses. The Hello Mickey room features Mickey Mouse in Neon. Photo by Gregg Jacobs. There's also a large Steamboat Willie setup, perfect for selfies, and an interesting feature. Playing side by side in a darkened area of the room are the original Steamboat Willie cartoon and a contemporary take on the film, featuring modern animation techniques (Claymation, etc.). I'll be honest. I walked away thinking the original was better, but it was interesting seeing modern animators giving it a modern spin. The next small room is entitled "Iconic Design". The idea is that Mickey's shape and silhouette remain an "ever-relevant and omnipresent force in popular culture." 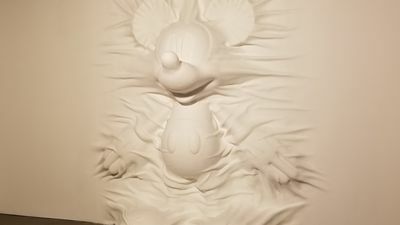 Contemporary artist Daniel Arsham has a work featured in this room of Mickey emerging from a wall. Daniel Arsham created a work of Mickey emerging from a wall. Photo by Gregg Jacobs. Next up is "It's Black and White", celebrating Mickey's early years in black and white shorts, such as Plane Crazy and Building a Building. The exhibit's interactive elements are on full display here. There are life-size mockups of "sets" from these films that you can enter and explore (and of course, take selfies). 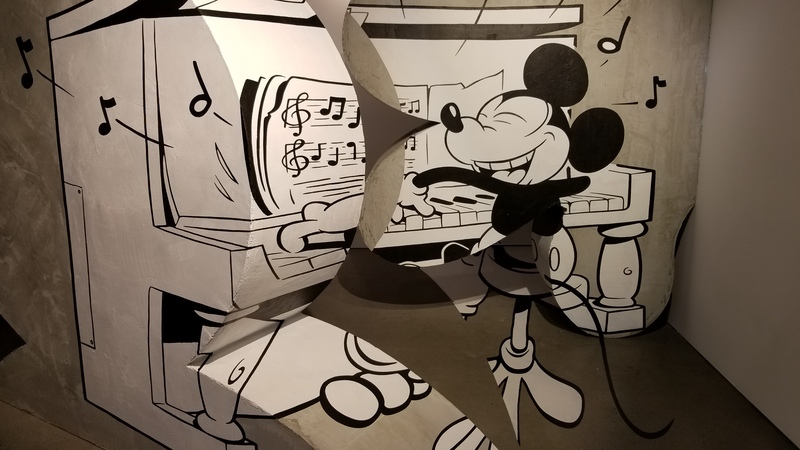 The really cool elements are are the "anamorphic illusions" (ok, I ripped that description off from the sign) whereby you stand on footprints across the room and see a 3D split image of Mickey come together in a cool way. See separate massive Disney 3D images unite through an anamorphic illusion. Photo by Gregg Jacobs. Also in the room is a large comic book installation featuring deconstructed original Mickey Mouse comics by artist Brian Roettinger. We then enter the Ink and Paint Department where Mickey bursts into color. You first go down a hallway with historic photos of Disney artists and designers from the 1930s and 1940s. They help put in context all the hard work these talented individuals did during the early years of Disney. My favorite setup in this room from the classic short, The Band Concert. In front of a colorful mural of Mickey and friends, there are a series of iPads, with each playing a scene from the short in order. The multi-media setup is top notch. A large colorful Mickey mural serves as the backdrop for the the famous short, "The Band Concert." Photo by Gregg Jacobs. The artists join in a big way here too. 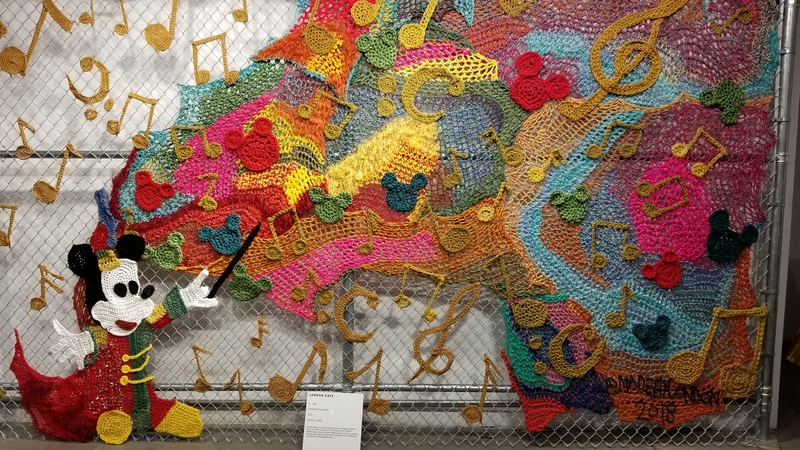 There's a giant (as in 10 feet tall giant) Mickey Mouse classic ringer tee by artist Amanda Ross-Ho, and huge, incredibly detailed crochet rendering of The Band Concert. Artist London Kaye created this impressive crochet rendering of "The Band Concert." Photo by Gregg Jacobs. This room sets the stage for the great Fantasia segment, The Sorcerer's Apprentice. The darkened room, lit by blacklight, really evokes the feel of the classic. There's an interactive giant sorcerer's hat that you can use for, you guessed it, selfies, and a great mirror effect with the iconic brooms. Mirrors create a great effect with a "Sorcerer's Apprentice" icon. Photo by Gregg Jacobs. For a bit of history, we learn that Sorcerer was originally conceived as its own short film, but it was so good, it inspired Walt to create the full-length Fantasia. There are also two "volcanos" in the room with a special treat. You look down into the volcano and see the animated test footage of Sorcerer Mickey conjuring the waters. The cast member told us that this is the first time this footage has been available to the general public and when the exhibit ends, it goes back into the Disney archives in California. The Mickey Mouse Club holds a huge place as part of the Disney legacy. There have been three iterations of the "club," the original in the 1950s, one from the 1970s, that I remember being glued to as a kid, and one in the 1990s that spawned more than one face that's familiar today. 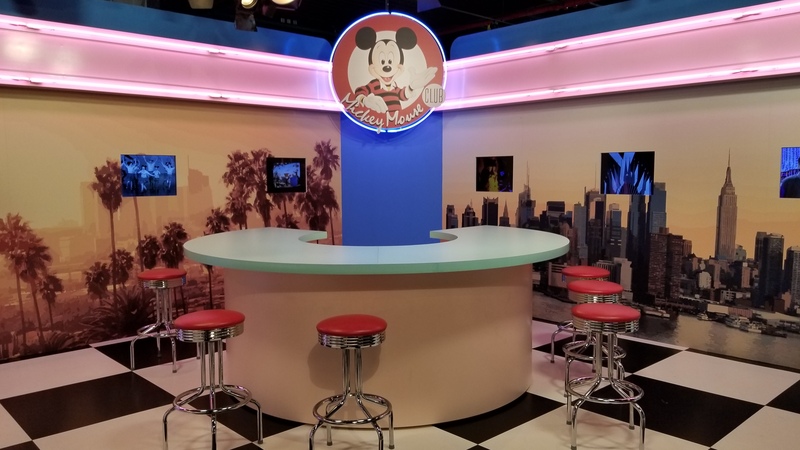 The Mickey Mouse Club room is themed to a 1950s soda shop. Photo by Gregg Jacobs. 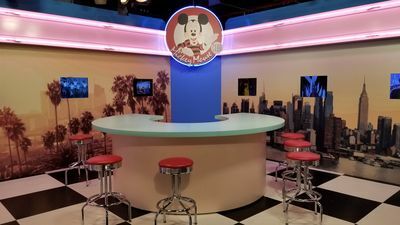 The room features props from the original series, including the large drum used on the show and cowboy costumes worn by Mouseketeers Annette and Cubby. Cowboy costumes worn by Annette and Cubby from the original 1950s incarnation of the Mickey Mouse Club. Photo by Gregg Jacobs. There are also video screens around the room playing scenes from the series. If you look closely (you actually don't even have to look closely), you'll see some pretty familiar faces. Justin Timberlake, Ryan Gosling, Britney Spears and Keri Russell were all part of the 1990s series. It's a lot of fun to see them dancing around with Mickey as kids. The concept behind this room is that Mickey has inspired "artists from around the world to create, reinterpret and reimagine." 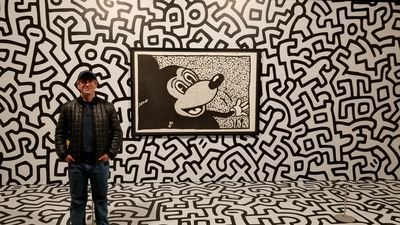 The centerpiece of this room is a famous image many of you have seen, a classic work by the late artist Keith Haring who once referred the Mickey Mouse as "a symbol of America." 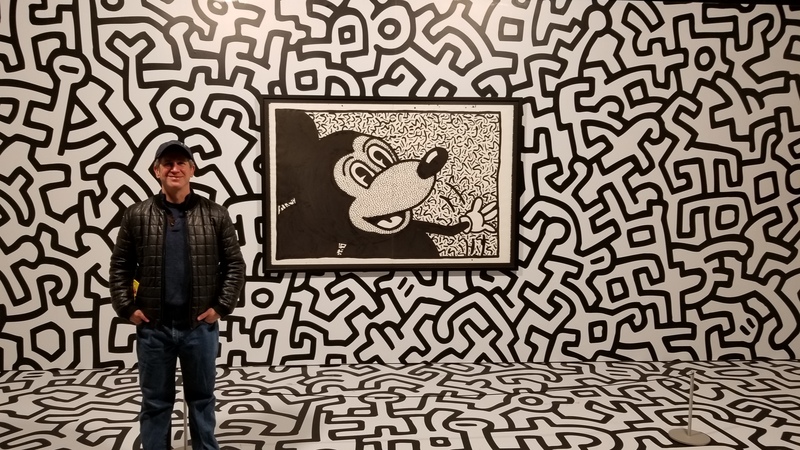 That's me in front of a classic Mickey Mouse work by famous artist Keith Haring. Photo by Gregg Jacobs. The concept here is really the concept of the whole exhibition. Mickey Mouse is an inspiration to us all and impacts how we see the world in different ways. The final room is a blending of old and new, and also a good segue into the shopping section of the article you all knew was coming. 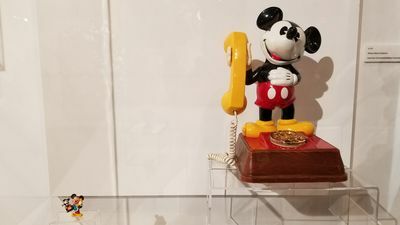 Around the room are classic Disney collectibles ranging from watches and clocks, plush and figurines from the 1930s and of course, the classic Mickey phone. The exhibit has a classic Mickey phone from the 1970s. Photo by Gregg Jacobs. 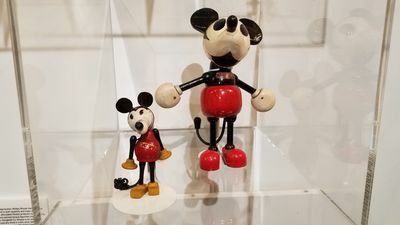 There are Mickey classic figurines from the 1930s. Photo by Gregg Jacobs. Intermixed among the classic memorabilia are modern items from some iconic brands. These include Coach, Levi's, Rag & Bone, and Shinola Watches. 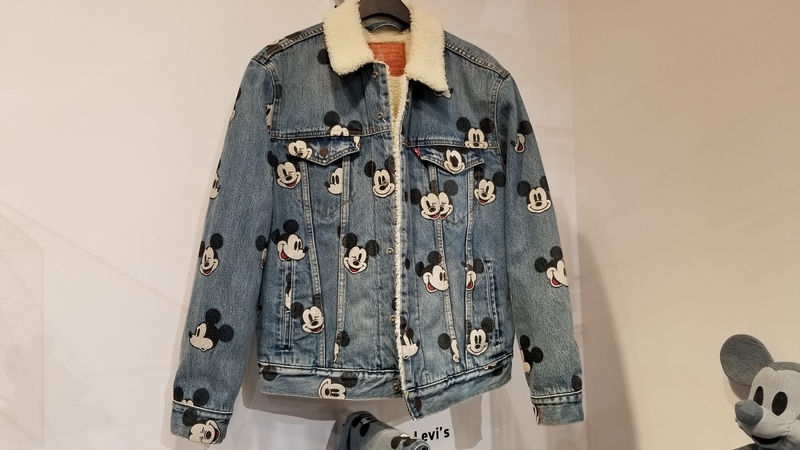 Levi's created this Mickey Mouse denim jacket. Photo by Gregg Jacobs. Off this room is also a fun little trivia game show. Utilizing Google Home, Mickey and friends ask you some questions and there are prizes at the end. I don't want to give anything away, but there are some creative hints if you get stumped. Of course my articles are usually about shopping and merchandise, so I can't disappoint by not talking about that now. Like most things Disney does, the exhibit lets out into a large gift shop. There were some interesting things to buy to commemorate your visit to the exhibit. Of particular interest when you enter is a display case by the main entrance. It contains different sets of merchandise comprised of a Pop figure and a set of three Mickey Mouse Pins. Each of these sets has a date next to it. Every other Saturday, on the date indicated, the shop will release a different set of these to public for sale. 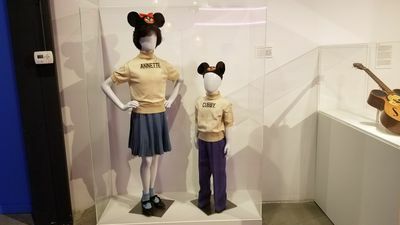 The first items went up on November 10th right after the exhibit opened, and according to a cast member, they sold out almost immediately. On each of these dates, there's a set of three Mickey Mouse pins and a Pop figurine that will go up for sale. Get them while you can. 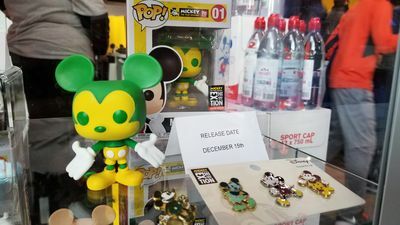 A new set of Mickey pins and a Pop figurine will go on sale every other Saturday for the length of the exhibit. Photo by Gregg Jacobs. Another fun section of the store is Mickey's Maker Shop. Here, they have a selection of tees, sweatshirts and hats for sale. What's unique is that you can choose one of many patches that can be applied to the item to make it unique and one of a kind. The items run from $20 for a baseball cap to around $50 for the sweatshirts. The patches are no additional charge (you get a certain number of them for each item). At Mickey's Maker Shop, you can design your own one of a kind item. Photo by Gregg Jacobs. This was my big purchase at the exhibit. A red Mickey Mouse baseball cap with nerdy Mickey on the front. I had them add a patch to the back that says "Cheers to the ears behind it all". As promised, as a segue from the exhibit's Collection room, there are some high-end retailers that put their own spin on mouse merchandise. The designer label Rag & Bone created some unique tees for sale. These ran a high end $150 each, though they were kind of cool. This unique Rag & Bone Mickey tee created for the exhibit will set you back $150. Photo by Gregg Jacobs. Much like they do at the theme parks these days, there are series of small figurines that you can buy in "mystery" boxes. 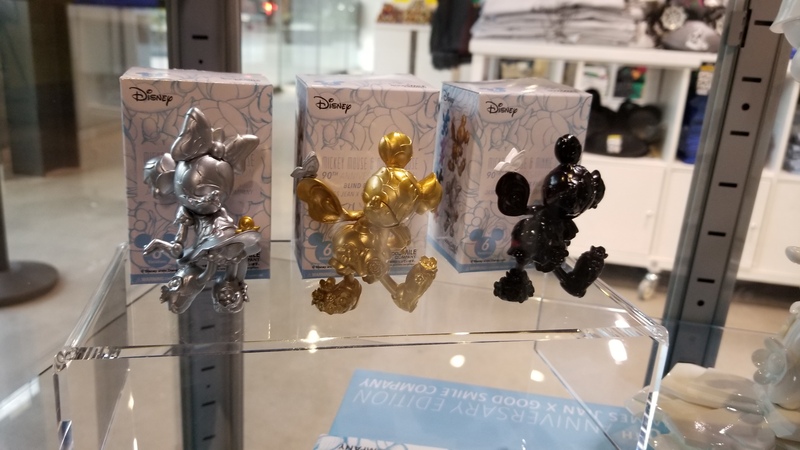 These feature Mickey in classic poses and in six different colors. These sell for $10 each, and you can buy one and be surprised as to which of the six you get or buy an entire set of 6 for $60 and know that you have them all. These Mickey figurines are of the collect them all variety. Photo by Gregg Jacobs. The crown jewel of the merchandise here might be the massive book, Walt Disney's Mickey Mouse, the Ultimate History. It's huge and comes in a collectible case. It sells for $200, though that may be a small price to pay for the most comprehensive guide to Mickey history I've ever seen (and I'll share a secret, Amazon sells it $20 cheaper). 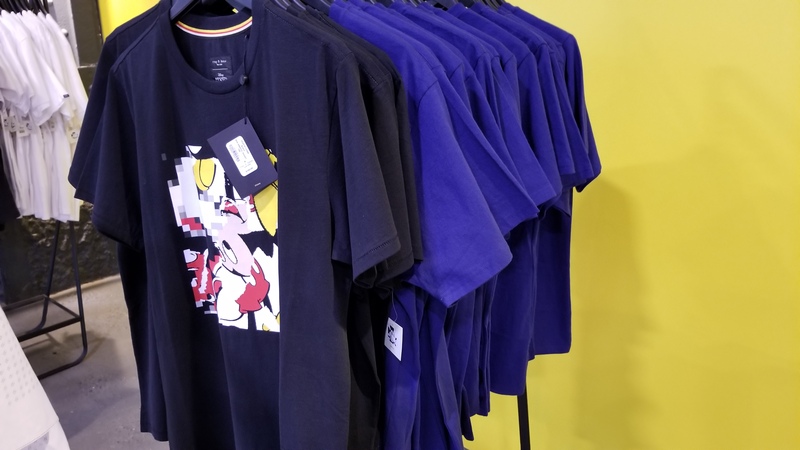 If you want something a little more reasonable, there are some great tees and sweatshirts in the Disney theme park price range. There are also journals, pins and patches. In the interest of keeping this article from becoming even longer than it is, I've only scratched the service. Pictures only capture a small part of how unique the exhibit really is. I highly recommend a visit to anyone interested in Disney, Americana or, of course, a certain iconic character. Most importantly "I only hope that we never lose sight of one thing, that it was all started by a mouse". Mickey Mouse, The True Original, is located in New York City at 60 10th Avenue, on the corner of 10th Avenue and 15th Street. It's currently running and goes through February 10th, 2019. Tickets are $38 and must be bought in advance for a particular day at a particular time (and those entry times are enforced, though we arrived 15 minutes early we allowed to enter). Entry times are in 20 minute increments between 10:00 and 800, every Tuesday - Sunday. They recommend you leave 90 minutes to walk through the entire exhibition, which is about how long it took us. 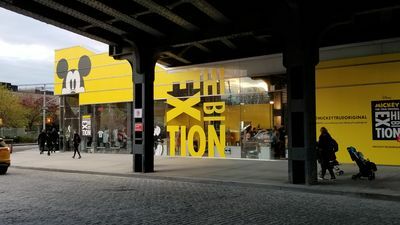 It's also located in a really cool part of the city near the now gentrified Meatpacking District and high line, old elevated railroad tracks that were turned into an innovative public park, so leave some time to walk around the area. 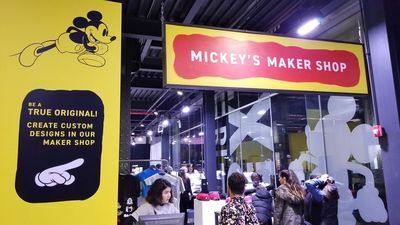 Mickey Mouse, The True Original is located in a unique warehouse space in New York City. Photo by Gregg Jacobs. Discuss this article on MousePad. MousePlanet is your independent consumer guide to Disney travel and vacations, covering Disneyland, Walt Disney World and the Disney Cruise Line. Look to MousePlanet for daily news, weekly theme park updates, and detailed travel and resort guides for your favorite Disney destinations. As with any endeavor of this size and complexity, we couldn't hope to succeed without the assistance of our readers. We encourage you to submit news, updates and feedback from your Disney travels. Subscribe to our weekly newsletter for all the latest updates. MousePlanet is not associated in any official way with the Walt Disney Company, its subsidiaries. or its affiliates. The official Disney site is available at www.disney.com. This MousePlanet Web site provides independent news articles, commentary, editorials, reviews. and guides about the Walt Disney Co. All information on this site is subject to change. Please contact destinations in advance to confirm the most up-to-date information.